The exact etiology of Squamous Cell Cancer is unknown. However medical textbooks point out different risk factors such as exposure to cancer-promoting stressors and the response of the body to those exposures combine to determine the risk of developing cutaneous SCC. 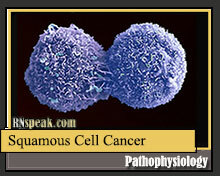 Where squamous cell cancer usually located? Head and neck are the usually location of SCC. It could be located in the mouth, tongue, throat, and other surrounding structures. What are the risk factors for this type of cancer? These risk factors include: exposure to ultraviolet (UV) radiation;, immunosuppression, use of tobacco or alcohol, age, familial or genetic predisposition, nutritional status, chronic irritation, and exposure to industrial products or heavy metals, viruses, or ionizing radiation. However these etiologic agents, as determined on the basis of demographic and statistical data, are of limited predictive value in any given individual. The primary risk factor of most SCC is cumulative lifetime sun exposure; that is, SCC can develop even if the history of sun exposure occurred decades before development of the skin lesion. The frequency of SCC is increased at lower latitudes, correlating with an increased intensity of ambient light. The component of sunlight believed to be most important in cutaneous carcinogenesis is UVB which is both an initiator and a promoter of carcinogenesis. One critical pathogenic event is the development of apoptotic resistance through functional loss of TP53, a well-studied tumor suppressor gene. Ultraviolet (UV) B-induced photo carcinogenesis appears to work by suppressing the immune system in several ways. The UVB spectrum inhibits antigen presentation, induces the release of immunosuppressive cytokines, and elicits DNA damage, specifically the generation of pyrimidine dimers in keratinocyte DNA that is a molecular trigger of UV-mediated immunosuppression. This process is known to result in genetic mutation of TP53. Upon subsequent UV radiation exposure, keratinocytes undergo clonal expansion, acquiring further genetic defects, and ultimately leading to invasive cutaneous SCC. Other tumor suppressor genes found to be mutated in SCC include P16 (INK4a) and P14 (ARF). Vitamin A deficiency and iron deficiency have been linked to oral and pharyngeal cancers. Nitrosamine-rich fish is a large part of the diet in many regions where nasopharyngeal carcinoma is prevalent. Exposure to arsenic is a well-established cause of cutaneous SCC and internal cancers. In the present day, the main source of arsenic is contaminated well water, mushrooms, and algae. It is also present in pesticides. Under normal conditions, oncogenes (cancer inducing cells) aid in growth and proliferation of cells. But once altered by a cancer-causing agent, they may cause a cell to transform into a malignant state. With activation oncogenes, tumor suppressing genes are inactivated which in our patient is TP53 which result in unregulated cell growth. Not only that, genes that also control apoptosis (programmed cell death) were also altered causing clonal expansion and furthermore tumor progression. Tumor progression and malignant conversion can cause several clinical manifestations. Manifestations differ from one patient to another depending on the location of the tumor and other several factors. In this article, tumor in the oropharyngeal area is discussed. Enlargement of the mass in the oropharyngeal area can cause cervical lymphadenopathy that can lead to obstruction of the airway and difficulty of breathing. The enlargement of the mass may also cause protrusion of the tongue which can lead to impaired speech and dysphagia. Thyroid could be displaced due to the mass which may result to hyperthyroidism symptoms such as uncontrolled production of T4. Since the effect of T4 is for metabolism, too much T4 can result to hypermetabolism which is manifested by increased heart rate, hyperactive deep tendon reflex, heat intolerance, restlessness and irritability. Malignant tumor eventually evades other organs. Metastasis is the spread of malignant tumor cells from primary site to distant secondary sites. The process of metastasis has several essential components that allow for the release of cells from the primary tumor and subsequent spread and attachment to structures in distant sites. In order for metastasis to occur, there must be rapid growth in the primary tumor. Only 1% of metastasizing tumor cells survive in the circulation and without a rapidly growing tumor capable of discharging volumes of malignant cells, it is unlikely that a metastatic event will occur. Most tumors must reach 1 cm in size before metastasis is possible. Tumor cells apparently do not metastasize until the primary site is vascularized. It is when new capillaries emerge into the peripheral region of the primary tumor that a linear increase in the number of cells or clumps of cells escaping into the vascular system occurs. It is speculated between endothelial cells in the advancing tips of proliferating capillaries which allow tumor cells to escape and enter the circulation system. Lastly, tumor progression and malignant conversion lead to increase metabolic rate of the patient. As Guyton (2006) stated “cancer tissue competes with normal tissue for nutrients. Because cancer cells continue to proliferate indefinitely, their number multiplying day by day, cancer cells demand essentially the nutrition available to the body. As a result, normal tissues gradually suffer nutritive death.” These eventually lead the body to increase consumption of glucose, glycogen, fat, and finally proteins to compensate for the loss. Protein loss can be evidenced by severe weight loss of a patient.